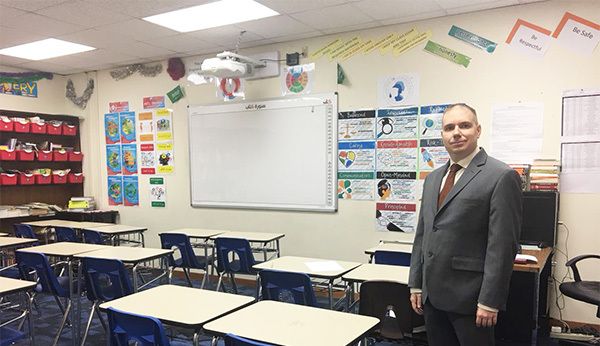 Jason Wright, '12, has taught secondary English Education in Kuwait, Saudi Arabia, and Thailand. Jason Wright, ’12, received unparalleled training in teamwork, discipline, and decision making before attending college. Yet, an education at Buffalo State instilled in this U.S. Marine the leadership skills needed to handle foreign situations—in the classroom. The Niagara Falls, New York, native served full active duty in the U.S. Marine Corps before attending Buffalo State. Over his tenure, Wright had postings in Iraq, Japan, and the Philippines. Wright said his experiences in the Marines taught him how to handle pressure and improved his mental stamina. He spent several months in an avionics training school in Pensacola, Florida, for the first role, and several months in Twentynine Palms, California, for the second role. In his last year of enlistment, Wright was deployed to Iraq for seven months, working in the Tactical Air Command Center, the highest echelon of Marine aviation command. He left the Marines with an honorable discharge in May 2008, enrolling at Buffalo State later that fall. Wright knew he wanted to teach but began his bachelor’s degree undecided between the English and social studies education programs. “Eventually I realized that English education was a better fit because I enjoyed the teaching of reading and writing more,” said Wright, who graduated with his bachelor’s in 2012. He said his time at Buffalo State was “extremely positive,” although he had to be proactive in terms of building a network on campus and connecting with other student-veterans. With assistance from Margaret Shaw-Burnett, associate vice president for continuing professional studies, Wright, along with several other student-veterans, established the first official student-veterans club in 2009. The club later became the Buffalo State Chapter for the Student Veterans of America, which is still highly active. Wright also served as president of the Buffalo State Nontraditional Students Organization and was active in other United Students Government organizations. By his last semester, he was ready to make another major change by returning overseas to work, this time, however, to use his teaching degree. He turned his attention to the vast international teaching market. “There are thousands of opportunities all over the world,” said Wright, who started a position as a secondary English education teacher in Thailand in 2013. Since he took the leap to teach abroad, he has worked in Thailand, Kuwait, and Saudi Arabia. “The most important lesson I’ve learned is to always remind myself that it’s OK to make mistakes, and that I won’t always be confident—but these are important steps in the growing process,” said Wright, who has spent nearly a decade of his life overseas between the military and teaching. Wright started a two-year contract with the Dhahran Ahliyya Schools in Al Khobar, Saudi Arabia, in August. While all his classrooms have been different, Wright follows a few rules for every new foreign-teaching opportunity. “I embrace the international values of the school; I am outgoing with my colleagues and other adults; and I work to create a rapport with as many people as possible,” he said. Wright adds that having an education degree from an American college has given him an advantage in terms of teaching English abroad. Wright said it’s important for college students to get out of their comfort zones—literally and figuratively—and he believes newly minted graduates from all disciplines should consider teaching abroad. Wright plans to pursue a master’s in education in the next few years and eventually return to the United States to teach.